Here's how you'll be building those homemade airships. 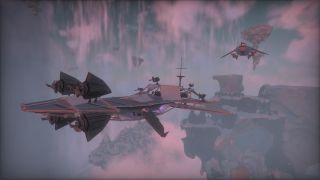 Bossa Studios' sandbox MMO Worlds Adrift is a game about exploring the skies via homemade airships, and a new trailer reveals how we'll be doing that. As you can see below, first you'll decide their overall shape with an in-game computer terminal thingy, before slapping weapons, parts and panels onto the frame. The video goes on to showcase what will probably happen next: fierce ship battles in the sky. Bossa recently released a free tool on Steam that lets you make your own floating islands, islands that could well appear in the game. The best were rounded up by the studio a few months ago, and if you're wanting to contribute, it's not too late.